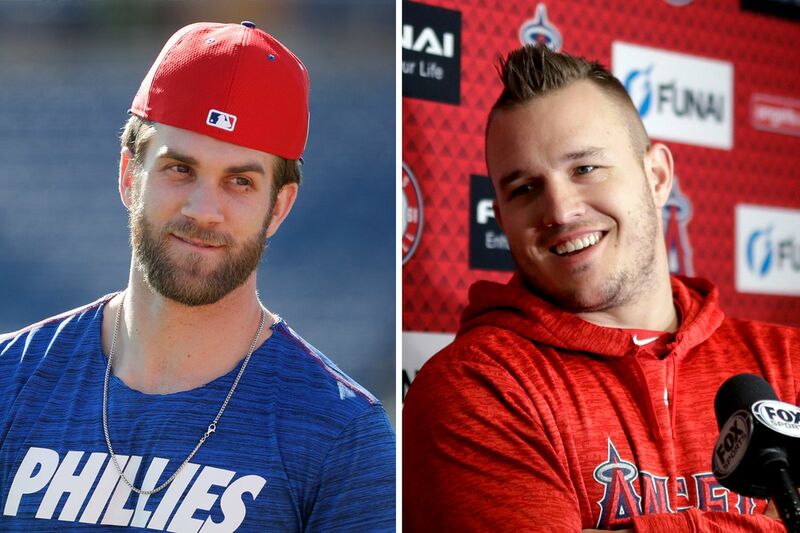 New Phillies outfielder Bryce Harper (left) said he would work hard to convince Los Angeles Angels superstar Mike Trout (right) to join the team when he becomes a free agent in 2020. The only name being mentioned as much as Bryce Harper by Phillies fans these days is Mike Trout. Trout, the Los Angeles Angels superstar and Millville, N.J., native, is scheduled to become a free agent in 2020. Considering the seven-time All Star is a die-hard Eagles fans and buds with Carson Wentz, Phillies fans have been salivating at the idea Trout could end up in red pinstripes playing alongside Harper. During an interview on 94.1 WIP Tuesday, Harper took things up a notch by saying he’d personally step in to try and convince Trout to sign with the Phillies once the Angels star becomes a free agent. “If you don’t think I’m not gonna call Mike Trout in 2020 to have him come to Philly, you’re crazy,” Harper told WIP hosts Jon Marks and Ike Reese from Phillies spring training in Clearwater, Fla.
Harper made it clear that part of the decision to spread his $330 million contract over 13 years was to give the Phillies flexibility when it came to adding players to the roster. Harper also said he’d be willing to help the team recruit other potential free agents, following the lead of Phillies owner John Middleton. According to my colleague Scott Lauber, it’s possible that the MLB could reach out to Harper over his comment about recruiting Trout, which might be seen as a violation of the league anti-tampering rules. It isn’t crazy to think that the Phillies could support the salaries of two of baseball’s most-talented young players. Harper’s 13-year, $330 million contract comes out to a manageable $25.385 million a year, and the team is only committed to six players beyond the 2020 season. Harper also discussed his decision to leave Washington, D.C., and travel up I-95 to Philadelphia. Phillies owner John Middletown referred to it as a “lifetime contract," and Harper said he didn’t want any opt-outs or to be traded, and hopes to one day raise a family in Philadelphia. “When I have kids one day, they can say they’re from Philly. That means something to people and for me to be able to say that, that’s what it’s all about,” Harper said on WIP. “I haven’t lived in Philly or anything like that, but the sense that I get is it’s like a big neighborhood. It’s something that people really understand, and they care. They care about their neighbor, they understand it."